Writers search for the ‘right’ names for the people who populate their books (or, they should!). There are many resources available for finding everyday names, of course. At the foot of this post you’ll find a suggested list; but wait a moment before you drop down there. Because here I want to invite you to consider the naming of characters living in invented worlds. Fantasy, of whatever sub-genre, generally requires names that aren’t in common use. Read any epic fantasy and you’ll find it brimming with constructed names, some memorable and others that ought never to have been forced onto the reading public. In fantasy, perhaps more than any other genre, it’s essential to invent names that don’t appear in other books, otherwise readers may associate your masterpiece with the work of another author. But, how to do it? How do you ‘invent’ names? For me, the most important aspect is the ‘mood’ or ‘feel’ of the work. When preparing the background for my fantasy A Seared Sky I started with a map: maps in fantasy are almost essential if your reader is to gain a proper understanding of where the action takes place. I named the places on my map by employing less commonly used alphabet letters, or, where those letters were common, by using them in unusual combinations or by doubling them. I applied the same rules to my characters, to give a sense of unity amongst place and character names. I started with simple names, as I wanted them to be easy to read and to stick in the minds of readers. But, because of the need for exclusivity, I ran each invention through a Google search to make sure it wasn’t already out there. In many cases, my simple names were already in evidence, either as fantasy characters, or as names or words used in foreign languages, sometimes as the names of real people. A point here: beware of accepting your made-up names without checking. There’s always the possibility that you’ve named your treasured heroine with a word that actually means ‘ugly moron’, or something worse, in another language! I had to modify my original choices in many cases. An original male character, ‘Gladron’, became ‘Aglydron’. I transposed letters, changed initial letters, added an odd ‘h’ or doubled the vowels, even inserted a hyphen or an apostrophe. A lot of effort? Perhaps. Especially since I’ve 93 named characters in the trilogy. But, I hope the names are memorable, easy to pronounce and sufficiently different to be distinguishable from other works of fiction. Pronunciation is another consideration: as the writer, you have a sound for each name in your head, which you try to translate into letters. But readers may well read these in different ways. I named one of my heroines ‘Tumalind’, which I pronounce as ‘Tewmallind’, but my wife, who does my beta reading, and my publisher, both pronounce the name as ‘Tummalind’. Does it matter? Do I mind? No. As long as readers are happy with the sound made by the letters, I’m happy for it to be read that way. English is a notoriously flexible language and it would be amazing if we were all to pronounce every word in the same way. I’d considered supplying a pronunciation guide but decided against, simply because that gives the reader choice, and reading is an active, not a passive, pursuit. Finally, as an author, you’ll want your names to reflect, as far as possible, the gender of the character. This is, to some extent, a matter of individual taste. But I tried to make my female names a little softer and my male names a little more brittle. I know some will see this as an unwelcome capitulation to perceived stereotypes, but I’m writing fantasy here, not making a political argument (although there are plenty of political analogies in the text for those who care to dig for them). My point is that I want to make the work as comfortable in terms of actual reading as possible. I don’t want to place barriers in the way of understanding by naming a male character, say, ‘Chellyth’, one of the lesser female names, or a female character, ‘Feldrark’, one of the more important male names. I believe names have a ‘sound’ that indicates gender and, whilst I accept that there’ll be differences in opinion about the particulars, I hope that the general rules have worked to support my choices. To sum up: check your choices against Google, or some other large search engine, to avoid embarrassing coincidences, try to maintain some consistency within the naming scheme, and attempt to match name to gender, if possible. Writing fantasy is great fun. It allows enormous freedom for the imagination. But it also requires a degree of discipline, if it isn’t to descend into the farcical. I enjoy the whole process of writing. I hope my readers enjoy the results and that writers have gained something useful from this post. 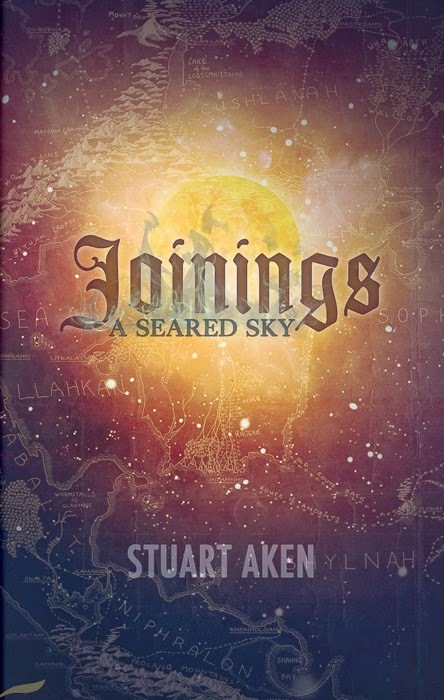 To buy a copy of Joinings in the UK click here. In the US, click here. 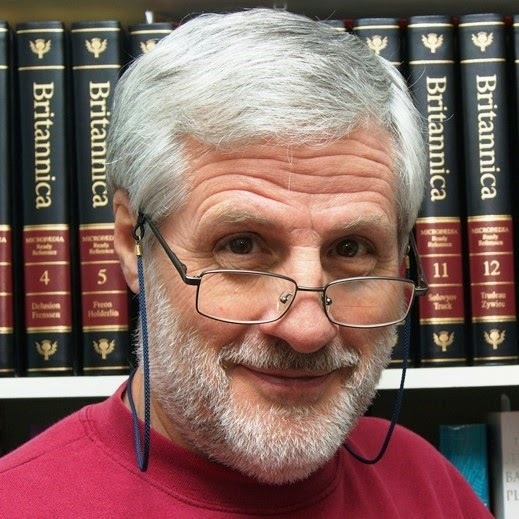 Stuart Aken has been writing since before the flood and says ‘antediluvian’ was a cliché even when he was young. He has seven books out and his most recent, the first volume of an epic fantasy trilogy launched on 30th March. You can discover more about A Seared Sky: Joinings on his blog, and be sure to connect with him on Facebook and Twitter. Thanks for joining us today, Stuart. I've read some brain-benders where character names are a mish-mash of punctuation marks and in serious need of a vowel or two. It just makes it hard work for the reader. I've gone easy on my readers and used names that do exist, but I've also tapped into Welsh and Greek, in particular, due to the backstory history of my book. And you're very right: Google is your friend. I had to change the first name of a character because a search revealed the full name to be the same as a real (deceased) person I didn't want my book associated with. It was an easy change, thankfully. All the best with your book, and the rest of the trilogy. Thank you for the opportunity, Elle. We need to reach out to readers as widely as we can and your site allows us to do just that. Thanks Elle. Yes, punctuation marks can be an issue. I use the rule of thumb that those used in normal names should be acceptable. So I employ - and ' both of which are in common use. And I always speak them aloud to make sure they can be pronounced. With one or two of my creature names, I used a translation program and chose the name that sounded 'right' for the creature. That way 'sheep' became 'ovella' - I can't now recall which language that is, though! Latin is another source that can be useful. Thanks for your comment. Fascinating post, Stuart. And some very useful pointers. In my view, your background work on this pays off because your character names are always spot on. I've wondered before how you do it. Should have known, it's not just some esoteric inbuilt talent, it's down to hard graft. Naming is a decision fraught with difficulties, no matter the genre. In my latest, a contemporary fantasy/thriller, I needed to bring in named police officers working from a real station in a real city in the UK. None of them were being portrayed as 'villains' but it still took a lot of searching via Google to ensure I didn't land myself with more problems than I could cope with. It was a fascinating article, Stuart, and thanks for the naming links. Most useful. Essential to avoid that dreaded law suit, Linda. Might bring some notoriety, but can be sooo expensive! Glad you found it useful. With a starring cast of over 100 characters in your latest novel Stuart, I expected nothing less than Jedi level advice as to how to name them all. You did not disappoint! Thanks! Thanks. It was a labour of love: I just enjoy using my imagination. And anything that enhances the story has got to be worth pursuing with the required effort. Your publisher, Stuart? Thank you for dropping in! Yes, my publisher, Dani. Dan, the owner, is a great guy. I have a hard enough time coming up with regular mystery-type names. Now I know one of the reasons I don't write fantasy. The other is I don't have that kind of imagination. Thanks for the interesting post. But I bet your imagination works in ways mine never could: that's why we choose to write the way we do. Hope the links were useful for your future naming challenges. One of my critique partners writes fantasy. For the draft chapters he submits to us, he uses spell check to find the suggested 'real word' and substitutes those for his character names because we complained that we couldn't tell people from places, and our brains were already substituting more familiar names. I'm going to send him to this post and see if he'll leave a comment. (But he's in England, so his time zone is way off from ours). As for my characters, I'm with Polly. I'm also in England, Terry, so we'll match on that point. Good idea to send him here. Always useful to connect with other writers in the field. And, as I said to Polly, our imaginations work differently, which is why we write differently. Thanks for your comment. Great post, Stuart! While I don't write fantasy, I still ponder over character names. Whether it's Tom or Mary, Tomika or Hezekiah, I want those names to stick in readers' minds and say something specific about the characters who carry them. Names are so vital in making characters and books memorable. If you doubt that, think Miss Marple, Inspector Jacques Clouseau, Scarlett O'Hara, Rhett Butler, Sherlock Holmes, and the list goes on and on. You're right, Linda. Names are vital in fiction; the more memorable, the better. Re your own choices, if the links above aren't helpful, visit my blog and look under 'Tools and links' where you'll find a compilation of 10,000 first names from all over the world. Ah, pronunciation, Diana; such a personal matter. So long as the reader is happy with their version of the word, that's all that really matters. We tend to 'sound' unusual words in our head as we read, until we accept them as 'normal' and get on with the reading again. Getting the balance between naming fantasy characters in the appropriate way and overwhelming the reader is, as you say, a challenge. But it's all part of the joy of writing in this genre for me. Don't forget the newspaper obituaries for names! Thanks Dani. On the basis that the dead can't sue! A useful resource. And, Dani, thank you so much for inviting me here today. Well, thank you, Dani. I enjoyed the experience. ... they call me, Mr. Hudson. Oh, wait, that was my dad! I can't repeat here what I'm usually called. We all have labels, don't we, Christopher? At one place of work I was 'Oi you!'. For some inexplicable reason I didn't stay there very long! Great post, Stuart, and great names. Absolutely right, Karen. (And you're forgiven - an appropriate modification, I think!) It's true; there are some names that just fit with certain expectations and would seem completely wrong used for heroes or heroines. Odd how easily we buy into stereotype, eh? Thanks for joining us today, Stuart. I don't write fantasy, and your post illuminates on of the reasons why. I am horrible at creating names out of thin air; the only time I tried they sounded as if some one with Welsh roots ended up in Eastern Europe. Not good. As long as fit our particular abilities to the writing we do, it's not necessary for us all to be able to do the same thing. Vive la difference, eh? Some fiction requires 'real' or at least 'familiar' names for the readers to feel comfortable with the story. Thanks for hosting me, Elspeth. I tend not to make up my own character names but to go through naming sites and find a name with a general meaning that fits what I want to use for the character. Some are odd, some are definitely not Western names, but I enjoy doing it th at way. Whatever works for you. We each have our own methods, and as long as they produce the required results, they're fine. Hopefully the links for the name sites were of some use to you. Alternatively, if you know of some others that are useful, perhaps you'd share them with us? I primarily use Behind The Name. So far it's my favorite and has the most extensive name files I've found. I'll have to check out some of the others you linked though. And you could always pop over to my own blog, look under the 'links and tools' tab, and you'll find my collection of 10,000 first names from all over the world. Thanks for sharing this, Dani. Have to say, I'm delighted by this thoughtful review. It's great when a reader appreciates your work. Interesting and enlightening post, Stuart. For me, unfortunately, names in fantasy are a barrier to reading the genre. I read many foreign authors, and I can easily imagine a Natsuo in Tokyo, or a Kainene in Nigeria, but somehow my brain stumbles when reading made-up names. I don't know why, but it does. A not uncommon problem, Madeleine, which is why I went to a lot of trouble to make my names easy to pronounce and read. I've come across fantasy tales where most of the names were impossible to pronounce and have given up trying to read such works. I hope you'll find my made up names a little less taxing and more reader friendly.